A few years ago, North American professional hockey leagues added a short overtime period if a regular season game was tied after regulation. During this five minute overtime period, the teams would only have four skaters instead of the normal five. This would result in more ice for each team to score. First team to score during the overtime period would get two points in the standings, the other team only one. Last Friday night, the Syracuse Crunch hosted Superhero Night. Fans came dressed as their favorite superhero and Captain America dropped the ceremonial puck. Jon DiSalvatore represented the Crunch for the puck drop for the first time since joining the team back in December. I point out this fact as it was Jon who did his best superhero impression by scoring the overtime winning goal that night while surrounded by Hershey Bears defenders. Coincidence? I think not! 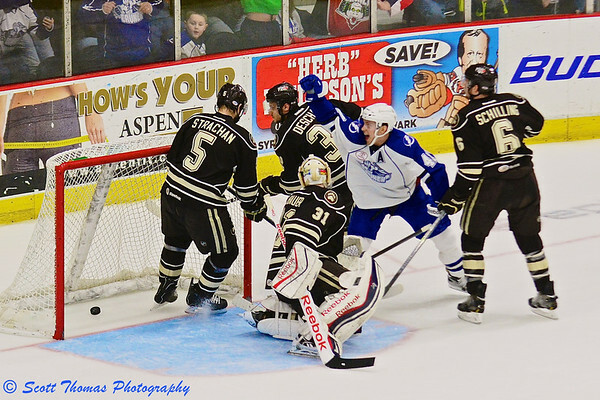 Syracuse Crunch Jon DiSalvatore (41) celebrates his overtime winning goal against the Hershey Bears in American Hockey League (AHL) action at the War Memorial Arena on Friday, March 14, 2014. Nikon D7100/70-200VR, 1/1000s, f/3.5, ISO 2000, EV +1.3, 125mm (192 mm DX) focal length. Still not satisfied with the amount of ties happening with the additional overtime period, the leagues implemented a Shootout similar to what was popular at the Winter Olympics hockey tournament. For the American Hockey League (AHL), the shootout consists of five skaters from each team one-on-one with the goalies. After five attempts, if the score was still tied, the shootout continued until a winner prevailed. The Crunch, after having won in overtime the night before, found themselves in a shootout on Saturday against the Hamilton Bulldogs. Tied at one after regulation and the overtime period, the coaches gave their list of five players to the referee. After the first five, the score was still tied as the goalies turned away every attempt. 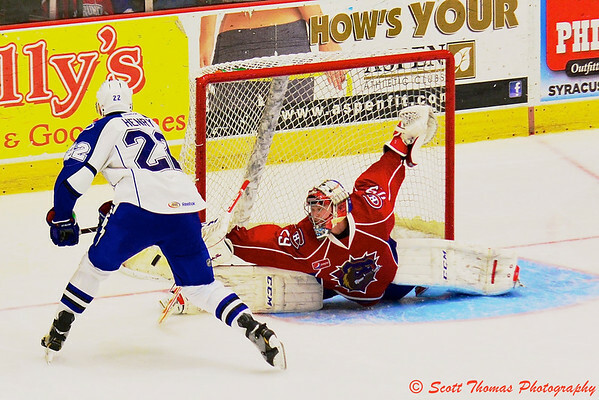 Syracuse Crunch Jordan Henry’s (22) shootout attempt is blocked by Hamilton Bulldogs goalie Robert Mayer (29) in American Hockey League (AHL) action at the War Memorial Arena on Saturday, March 15, 2014. Nikon D7100/70-200VR, 1/1000s, f/3.5, ISO 1800, EV +1.3, 135mm (202.5 mm DX) focal length. On Hamilton’s ninth skater, Mike Blunden, fired a blistering shot past the Crunch’s goalie Kristers Guldevskis for the game winner. There are people who dislike the shootout and there is talk of adding another short overtime period and only having three skaters on the ice. For me, I like the current format, as there is always a winner. The fans certainly like the extra entertainment. As a photographer, I love the fact I will know when and where the big moments will happen during the overtime and shootout to get shoots like these. This entry was posted in Sports, Weekly View and tagged 70-200mm, bears, bulldogs, celebration, crunch, drama, gloves, goalie, hamilton, helmets, hershey, ice hockey, mask, new york, nikon D7100, onondaga county, overtime, pads, puck, save, shootout, sticks, syracuse, vr, war memorial. Bookmark the permalink.